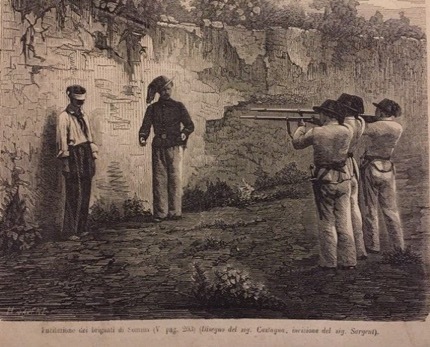 On this date in 1863, the famed Italian bandit Antonio Locaso was shot in Castellaneta at the tender age of 22. A former goatherd, Locaso supposedly embarked his career in brigandage in the classic style of the social bandit, impetuously intervening to fight off an agent of the law who was bent on ill-treating some penniless neighbors. He thereafter was compelled to conceal himself in the wildernesses near Castellaneta,* down at the hinge of the Italic boot’s heel. No mere highwayman, he fell in as a lieutenant of the ex-Bourbon officer turned outlaw/rebel Sergente Romano. This brought a violent crackdown by the Kingdom of Italy. * Although it’s hardly a city on the front rank of the world’s conscience, it’s on the credit scroll of every episode of The Simpsons as it confers the municipal ancestry and the surname on Homer Simpson voice actor Dan Castellaneta.